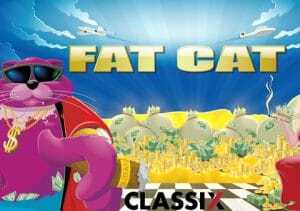 Join a gang of blingy pets in Fat Cat, a flashy 5 reel, 20 payline video slot from NextGen Gaming. Highlights of this simple game are the picks round where multipliers can send payouts soaring to up to 500 times your stake and the free spins feature where all payouts are trebled. Available to play on desktop, tablet or mobile devices, stakes range from 20p to £200 per spin. NextGen Gaming has kept things pretty basic here – the cartoon design has a blingy theme but a slightly old school feel. With private jets, helicopters, gold coins and oodles of cash in the background, the imagery has a strong luxury feel. Joining the lower value A to 9 values are a sack bulging with money and a canine butler. Both of these symbols offer awards of up to 500 coins per payline. More rewarding still is the posing female cat who’ll get you 1,500 coins if you land 5 on a line. Bonus feature – this pick me feature is triggered when you land a Fat Cat wild on reels 1 and 5 on the same spin. Choose from the objects shown until you find 2 that match. That amount is the prize you’ll win. Hope to see a multiplier which could send your award rocketing by up to 5x. Prizes of up to 500 times your bet are on offer here. Free Games feature – this round is triggered by landing 3 of the gold dollar sign scatters from left to right. You’ll then be awarded 10 free spins as well as a payout of 5, 10 or 100 times your total stake. All payouts landed during the free spins are trebled (apart from scatter pays). You can re-trigger more free spins and land the Bonus feature from within this feature. Despite the blingy theme, there’s nothing too flashy here. The cartoon imagery is simply done and works rather well. It’s a similar story with the features. They’re perfectly solid but nothing we haven’t seen in plenty of other video slots. The overall variance is in the medium range with potential wins of over 1,000 times your bet. Both the picks round and the free spins offer some decent potential for action courtesy of the multipliers. If you fancy trying a simple, light-hearted game that still offers the chance for some potential bonus round excitement then Fat Cat is certainly worth a look. Alternatively, Wonder Hounds by NextGen Gaming is a better game as to is NetEnt’s Piggy Riches which focuses on blingy pigs!